ABB Australia has introduced a range of DIN rail mounting time switches with the convenient function of a memory key. The new time switch range from ABB includes a model known as DT1-IK, which offers the ability to save a programme onto a special USB style key. This allows the user to create a time switch programme easily through the time switch key pad and save the programme to the key. Additional time switches can then have the programme downloaded from the key, saving time and ensuring reliability of the programme from a proven source. Once programmed the key could be easily sent to remote locations to download an updated programme onto an existing installed time switch. In an OEM application, the programme can be rapidly downloaded into multiple identical control systems, taking away the need for individual programming and saving pre-commissioning time. A software programme and a programming interface is also available to allow convenient programming of the key through a computer. The DT range is highly compact at only 2 modules wide and provides up to 5 years power reserve from an internal lithium battery. 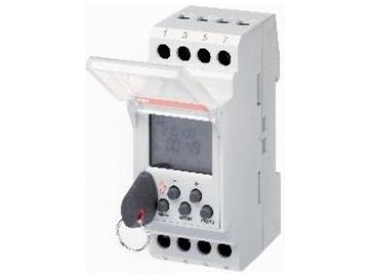 The time switch allows 56 programming steps and it is capable of a pulse output from 1 second to 30 minutes as well as automatic daylight saving time changes. A random mode can simulate the presence of activity in a random sequence when using the time switch for security lighting, etc. Capable of switching a 16A resistive or 10A inductive load, the DT1 time switch provides a convenient solution to control load switching of a variety of situations, from security applications to rationalising power consumption.